Welcome to Shagbark Resort in Pigeon Forge, TN! 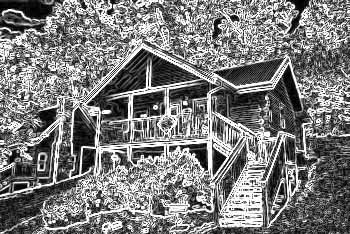 This beautiful, gated cabin community in the Smokies has a host of features that are bound to make your vacation a true delight. Not only does this gated resort community offer 24-hour security, but it also comes complete with a swimming pool, basketball courts, and tennis courts for guests to enjoy! During the warm summer months, you can enjoy sunning yourself by the seasonal outdoor pool. In the winter, you'll love curling up by the fireplace in your cozy log cabin in the mountains. Shagbark Resort is located between Pigeon Forge and Wears Valley in the Great Smoky Mountains. This prime location keeps guests close to the biggest attractions in the Smokies, while also ensuring that vacationers enjoy a peaceful spot in the mountains. The Shagbark Resort area is only about 15 minutes from Downtown Pigeon Forge via Waldens Creek Road, so guests can easily reach top local attractions like Dollywood, The Titanic Museum, and the Island. Additionally, the scenic community of Wears Valley is only a short drive away where you'll find unique local restaurants and moonshine distilleries. From here, vacationers can access the Great Smoky Mountains National Park via the Metcalf Bottoms entrance or the Townsend entrance. Book your Shagbark Resort cabin online today with Cabins USA to save 15% on your nightly rate!